Oeyama Shuten doji. 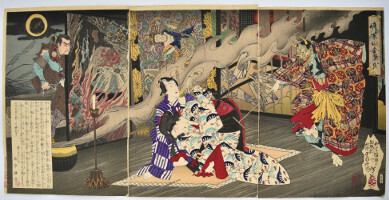 Shows Minamoto no Raiko and his four retainers, from left to right: Sakata no Kintoki, Usui no Sadamitsu, Watanabe no Tsuna and Urabe no Suyetake on Oyeyama, “Devil’s Mountain.” In the year 995 the Emperor commanded Raiko to kill the beast who had been kidnapping and eating young maidens around Kyoto. They accomplished this by dressing as priests and getting Shuten-doji incapacitated with alcohol. 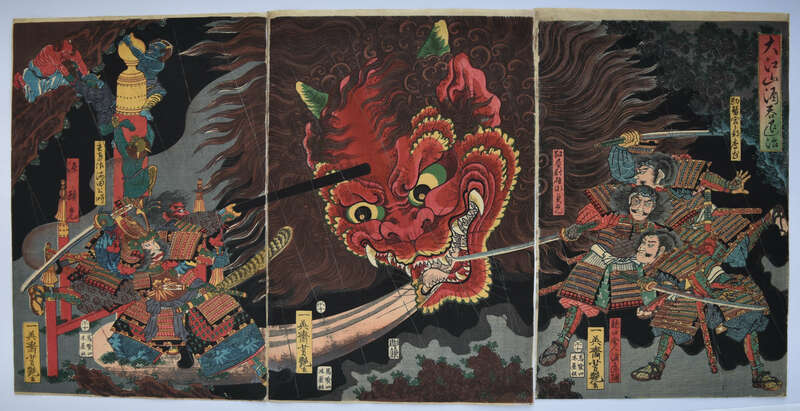 Raiko has just decapitated the giant head of the demon which then descends on his helmet which saves him. 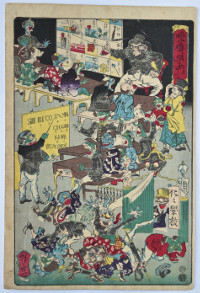 Published 1855 by Kiya Sojiro . A fine design. Fine impression and colour. Expert edge repair at top right edge of first sheet, otherwise very good condition. Signed Ichieisai Yoshitsuya ga.
A pillar print showing a beauty after a bath walking past a pot of morning glory. Published c. 1768. The morning glory is a precursor of hot summer. Some 40 or 50 years later there was a craze for these plants almost akin to Dutch tulip fever. Other (faded) impressions are in MFA, Boston, Spaulding Collection, nr. 21.4552; Honolulu Museum of Art, nr. 06108; and illustrated in Waterhouse, The Harunobu Decade, 20013, nr. 545. 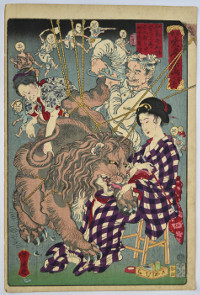 Harunobu produced some of the most sublime Ukiyo-e images and he and his publishers were at the forefront of experimentation in the 1760s using multiple blocks, new pigments and combing pigments to create new hues that were not see again in Ukiyo-e. Unfortunately, the pigments – most often of vegetable origin – were very susceptible to fading and most Harunobu prints are ghosts of their former selves. 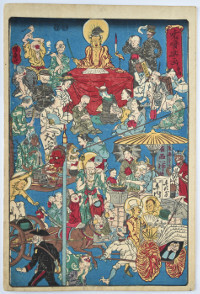 Harunobu was a master of this hashira-e format: Jacob Pins found 111 to illustrate in The Japanese Pillar Print, 1982. Rare. Fine impression. Exceptionally good colour. Minor soil but in very good condition for a print in this format and of this period. (These prints were hung in alcoves or on pillars and they consequently often come browned or faded as well as getting creased by being rolled.) Signed Harunobu ga.
Miya, Atsuta shinji, “Miya, Festival of the Atsuta Shrine.” Number 41 from the famous Tokaido gojusan tsugi no uchi, “The Fifty-three Stations of the Tokaido.” Published by Hoeido, c. 1833-4. 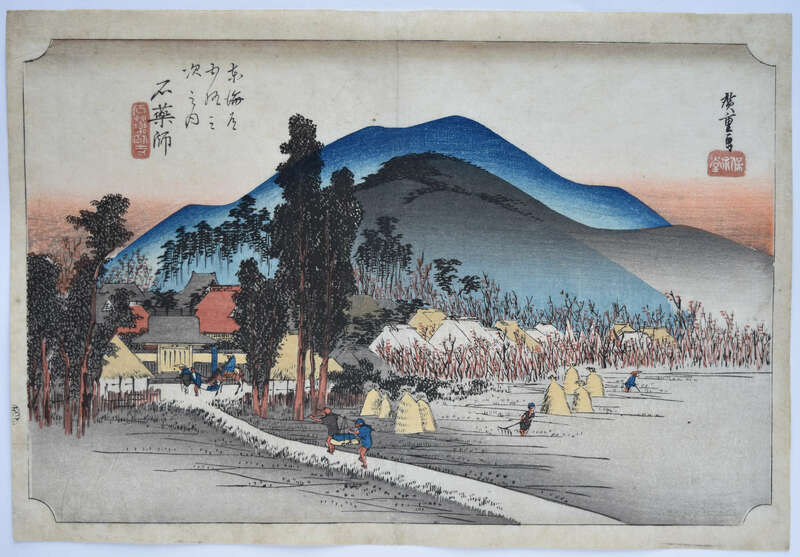 Hiroshige travelled the length of the Tokaido as part of an official delegation in 1832 making sketches along the way. On his return he started work on the set eventually producing 55 prints. The first of the designs were published jointly by Hoeido and Senkakudo, but then Hoeido took over the production. Miya was the largest station on the Tokaido. There were many inns catering for the pilgrims going to Ise and daimyo travelling to Edo. Shows the horse-driving festival held at the Shinto Atsuta Shrine, the Hama Gateway to the right. This is the rare first edition. Fine impression. Slight fading of seals, slight centre fold and minimal soil to left edge, otherwise very good condition. 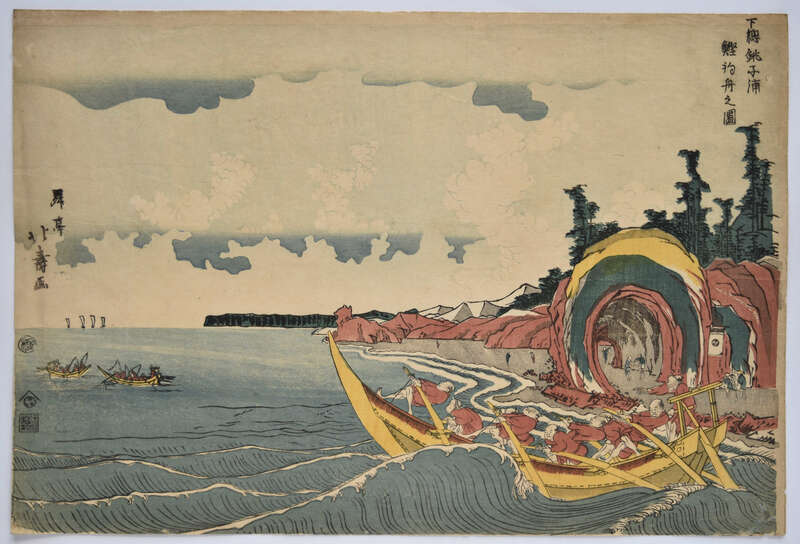 Signed Hiroshige ga.
Shimosa Choshi no ura katsuo tsuribune, “Fishing for Bonito in Choshi Bay in Shimosa Province.” Hokuju, a pupil of Hokusai, produced a number of these fine “westernized” landscapes designed with stylised clouds, cubistic mountains and shadows cast by figures. This is one of the best. Bonito is a favourite fish in Japan where it is in the markets from around May each year. Choshin Bay has always produced the largest seafood catch in Japan. Hokuju produced a substantial body of work in this vein. However, he was not the only one. Okyo, Toyoharu, Hokusai, Kunitora, Kuninao and Shinsai also designed prints in this genre, as well as other artists producing examples. 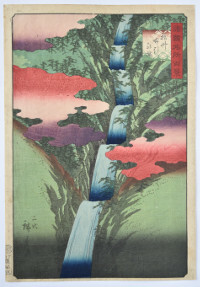 Interestingly, Hiroshige, the pre-eminent landscape artist, designed nothing like this. Indeed, the influences flowed the other way before too long, Hiroshige being a favourite of the Impressionists. This is the rare first edition published by Eijudo, c. 1820. His landscapes were republished by Yamamoto. Rare. Fine impression and colour. Very good condition. Full size. Signed Shotei Hokuju ga.
An original painting, sumi and colour on silk, 33.25 x 12 in; 84.5 x 30.5 cms. 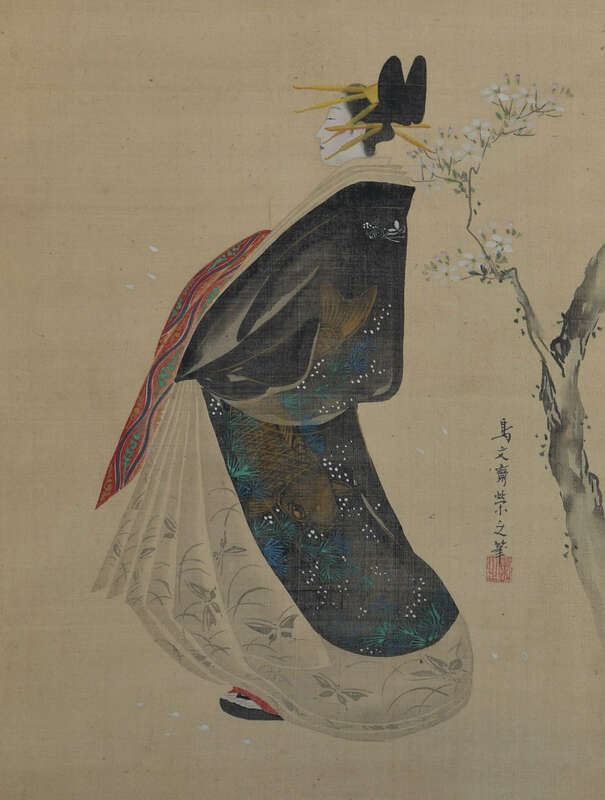 Shows a parading oiran, a high class courtesan, beneath falling cherry blossom. A parade was held every April in the Yoshiwara under the spring cherry blossom. Her costume is decorated with a large golden koi swimming amongst water weeds. An elegant and refined painting of great delicacy typical of this painter who was of unusually high rank for an Ukiyo-e artist. His prints – usually of beauties – are equally elegant. He also had a considerable number of pupils, including Eisho, Eiri and Eisui who produced some exceptional compositions. Probably painted around 1795-1804. Mount with some minor damage; painted area in very good condition. Signed Chobunsai Eishi hitsu with Eishi seal. An original painting, sumi and full colour on paper, 24 x 12 in; 61 x 30.5 cms. 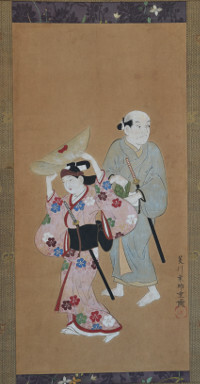 Shows a beautiful youth (a wakashu) dressed as a girl with his attendant servant. 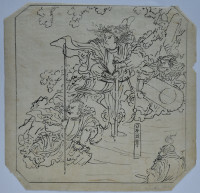 These youths (identified as male by wearing a sword) were arbiters of trend-setting kimono design. They are sometimes referred to as the “third gender,” and were sexually ambiguous being objects of desire to both adult men and women. 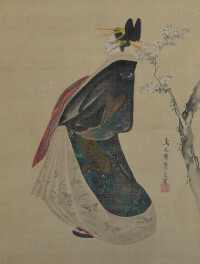 Moroshige was the senior pupil of Hishikawa Moronobu, and, it is said, was the father of Furuyama Moromasa. Some toning of paper and slight loss of pigment, but all commensurate with a painting of this age. Otherwise good condition. Painted around 1700. Signed Hishikawa Moroshige zu with seal Moroshige. A fine and interesting painting. 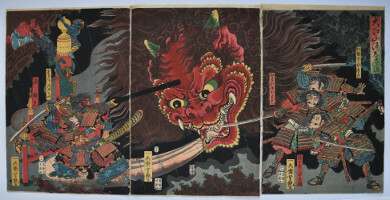 An hosoban benizuri-e showing the actor Ichimura Uzaemon IX as Soga no Goro Tokimune, brandishing a club, and riding to avenge the murder of his father by Kudo Suketsune. Published c. 1768. (The publisher’s seal may be on the underside of the horse.) Kiyomitsu was the second son of Kiyomasu II. Very good impression and colour. Light album backing, otherwise very good condition. 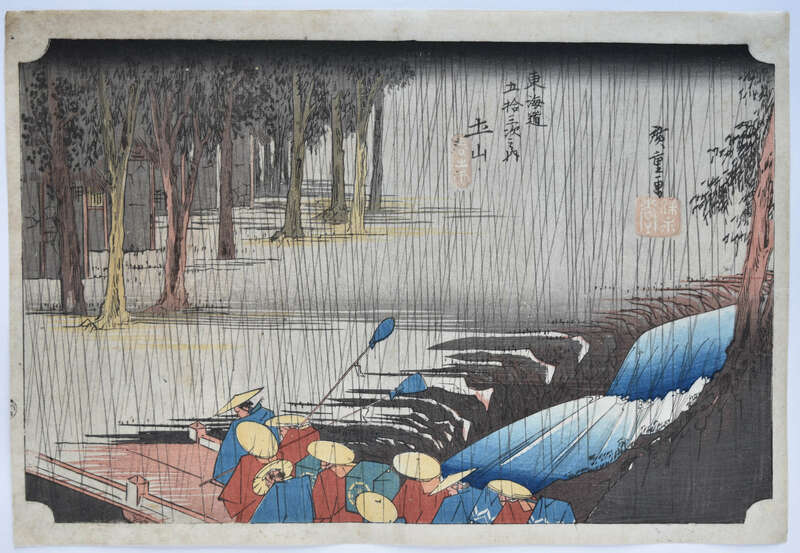 Signed Torii Kiyomitsu ga.
Tsuchiyama, haru no ame, “Tsuchiyama, Spring Rain.” Number 49 from the famous Tokaido gojusan tsugi no uchi, “The Fifty-three Stations of the Tokaido.” Published by Hoeido, c. 1833-4. 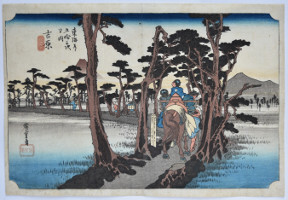 Hiroshige travelled the length of the Tokaido as part of an official delegation in 1832 making sketches along the way. On his return he started work on the set eventually producing 55 prints. The first of the designs were published jointly by Hoeido and Senkakudo, but then Hoeido took over the production. 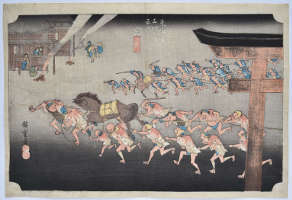 Shows a daimyo’s cortege crossing the Tamura River. Tsuchiyama flourished because of its location at the entrance to the Suzuka Pass. However, in Meiji times, the town was bypassed by the railway because of the steep gradients here. This is the rare first edition. 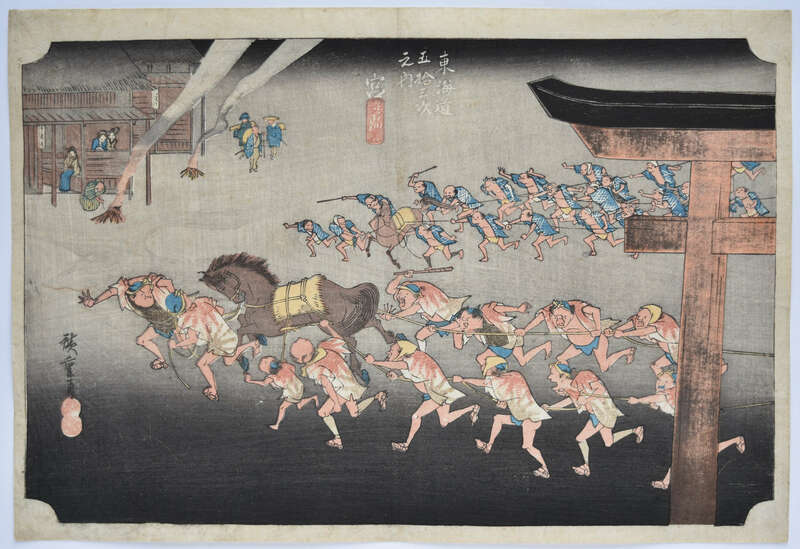 Ishiyakushi, number 44 from the Tokaido showing figures entering the village with others working in the fields. Ishiyakushi-ji Temple was seen on entering the village. From the famous Tokaido gojusan tsugi no uchi, “The Fifty-three Stations of the Tokaido.” Published by Hoeido, c. 1833-4. 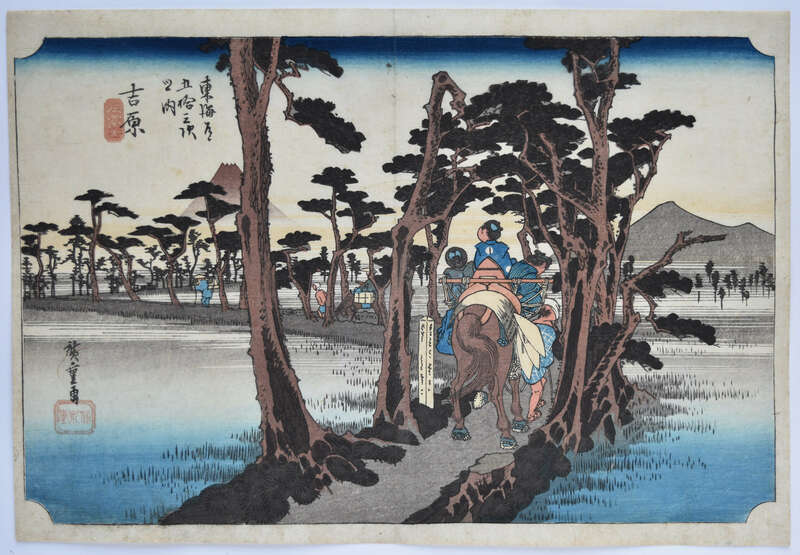 Hiroshige travelled the length of the Tokaido as part of an official delegation in 1832 making sketches along the way. On his return he started work on the set eventually producing 55 prints. The first of the designs were published jointly by Hoeido and Senkakudo, but then Hoeido took over the production. This is the rare first edition. Okabe, Utsu no yama, “Okabe, Utsu Mountain.” Number 21 from the famous Tokaido gojusan tsugi no uchi, “The Fifty-three Stations of the Tokaido.” Published by Hoeido, c. 1833-4. 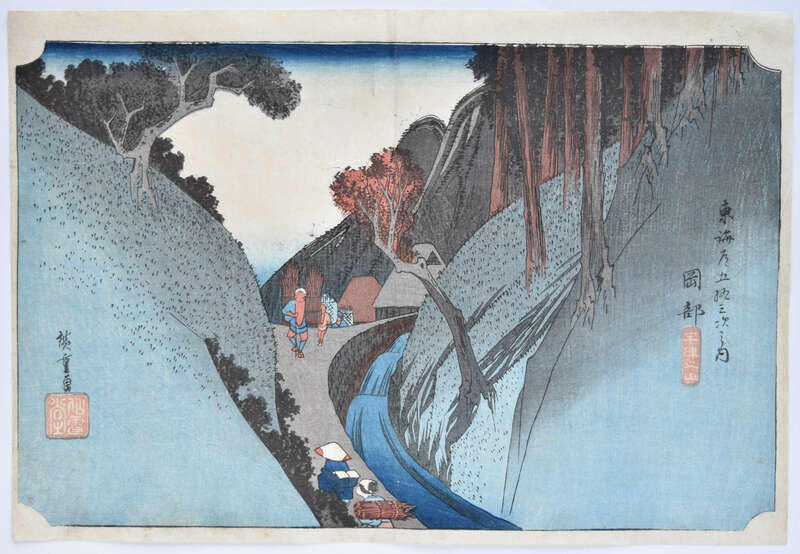 Hiroshige travelled the length of the Tokaido as part of an official delegation in 1832 making sketches along the way. On his return he started work on the set eventually producing 55 prints. The first of the designs were published jointly by Hoeido and Senkakudo, but then Hoeido took over the production. Utsunoya Pass is just before Okabe. The pass is the scene of a Kabuki play by Mokuami Kawatake (1816-1893) where Jubei Itamiya kills and robs the blind Bun’ya. This is the rare first edition. Yoshiwara, hidari Fuji, “Yoshiwara, Mount Fuji on the left.” Number 14 from the famous Tokaido gojusan tsugi no uchi, “The Fifty-three Stations of the Tokaido.” Published by Hoeido, c. 1833-4. Hiroshige travelled the length of the Tokaido as part of an official delegation in 1832 making sketches along the way. On his return he started work on the set eventually producing 55 prints. The first of the designs were published jointly by Hoeido and Senkakudo, but then Hoeido took over the production. After being destroyed by a tidal wave in 1680 Yoshiwara was rebuilt further inland from the sea. This is the rare first edition. 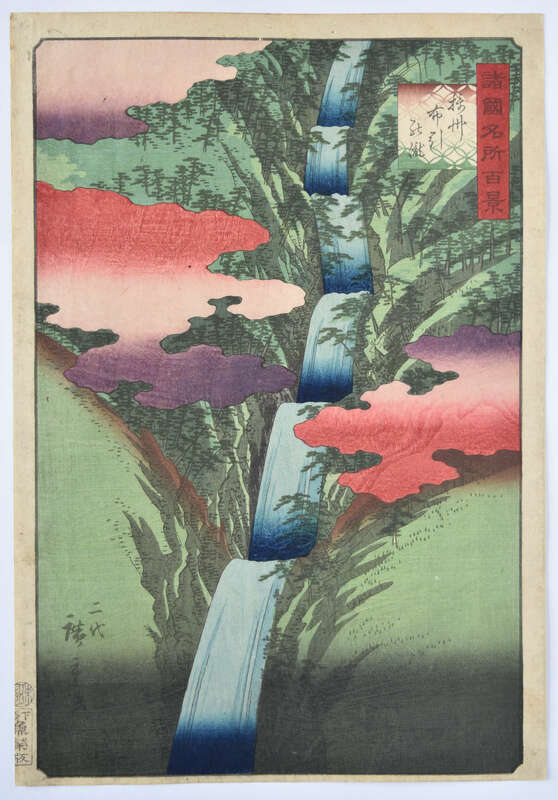 Sesshu Nunobiki no taki, “The Nunobiki Waterfall in Settsu Province,” from a set Shokoku meisho hyakkei, “One Hundred Famous Views in the Various Provinces.” The set published by Uoya Eikichi between 1859 and 1861 (this being 1859). He was the pupil of Hiroshige, given the name Shigenobu. After Hiroshige’s death he married his adopted daughter and became Hiroshige II. The couple were divorced in 1865. She went on to marry another pupil of her father’s – Shigemasa, who became Hiroshige III. Superb impression and colour with extensive mica and woodgrain. Fine condition. 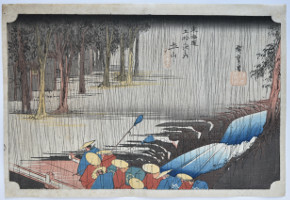 Signed “The second” Hiroshige ga. 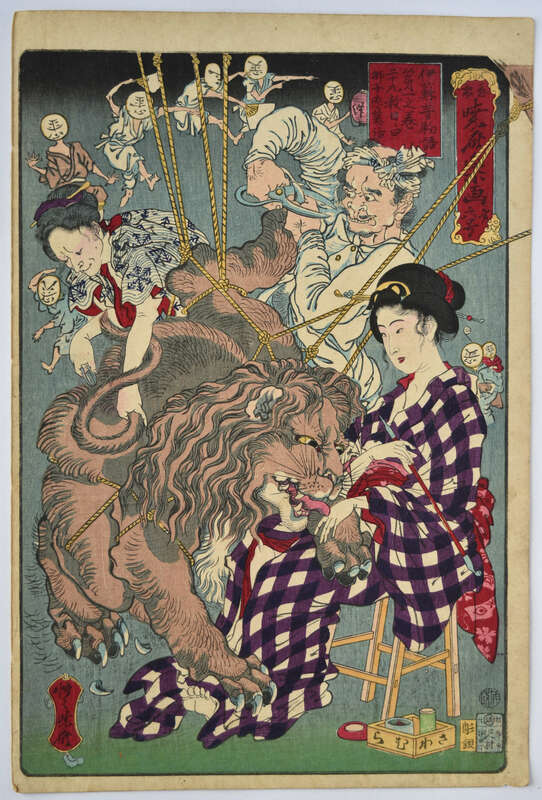 The lion falling in love from a set Kyosai rakuga, “Kyosai’s Drawings for Pleasure.”A satirical take on current events and mores. A design based on Aesop’s Fables which tells of a lion falling in love with a beautiful girl and asking her to marry him. Her bemused parents set a challenge for him: to have his claws removed and teeth filed. He duly submits only to have the parents then laugh and ask him to do his worst. Published 1874 by Sawamuraya Seikichi. A set of 15 prints was planned but only 12 are known. Fine impression and colour. Light album backing, otherwise very good condition. 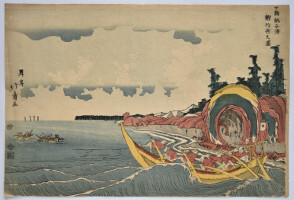 Signed Seisai Kyosai. 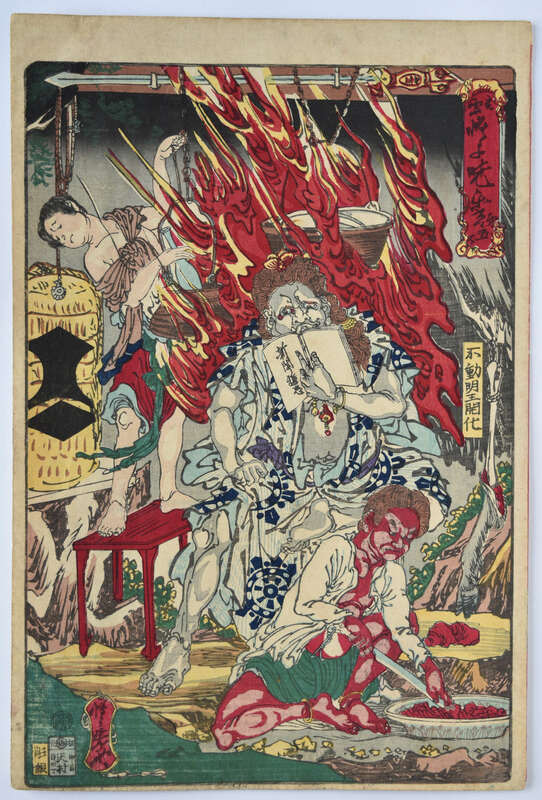 The enlightenment of Fudo Myoo – a Buddhist deity who is always depicted seated on a rock engulfed by flames. From a set Kyosai rakuga, “Kyosai’s Drawings for Pleasure.” A satirical take on current events and mores. 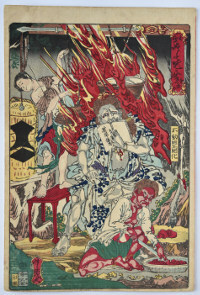 This satirical image shows him reading a modern newspaper, his attendant Seitaka prepares meat and Kongara hangs a pot of stew in his flames. (Meat eating was being introduced.) Published 1874 by Sawamuraya Seikichi. A set of 15 prints was planned but only 12 are known. The enlightenment of Paradise or liberation of the dead from Hell from a set Kyosai rakuga, “Kyosai’s Drawings for Pleasure.” A satirical take on current events and mores. The demons from Hell get new jobs as postmen, rikisha men etc. Published 1874 by Sawamuraya Seikichi. A set of 15 prints was planned but only 12 are known. A school for spooks from a set Kyosai rakuga, “Kyosai’s Drawings for Pleasure.” A satirical take on current events and mores. In 1874 a new system of education was introduced in Japan – even for the world of ghouls. Shoki is seen teaching the demons basic hellish terms, and the chief of the kappa instructs the ghosts on the Roman alphabet. Published 1874 by Sawamuraya Seikichi. A set of 15 prints was planned but only 12 are known. A fine original sumi drawing (hanshita-e) of oban size for an unpublished set: Eiyu kumiuchi zu, “Collection of Heroes in Combat.” Has a date seal for 1856. Sumi and light colour with pentimenti on thin paper. 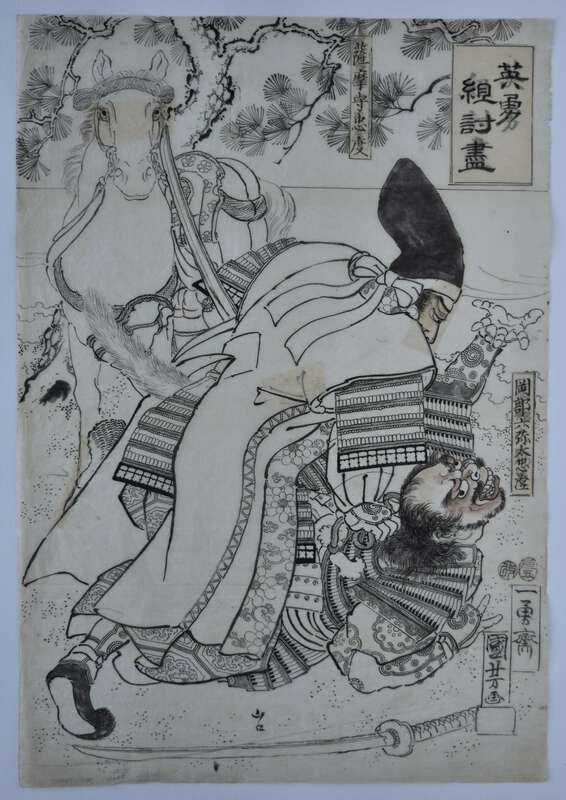 Shows the protagonists Satsuma no Kami Tadanori, a famous general of the Taira Clan, in combat with Okabe Rokuyata Tadasumi of the Minamoto Clan during the Genpei wars of 1180-1185. In extremely good condition. 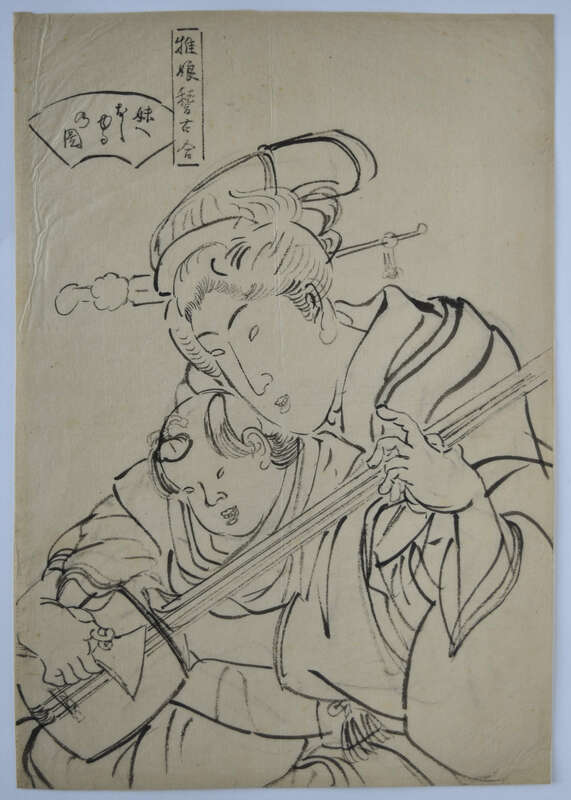 Signed Ichiyusai Kuniyoshi ga. Rare. A fine original sumi drawing (hanshita-e) of oban size for an unpublished set, c. 1856. Sumi and light colour with extensive pentimenti on thin paper. 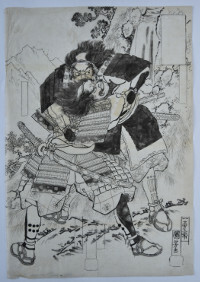 Shows two samurai in combat. In extremely good condition. 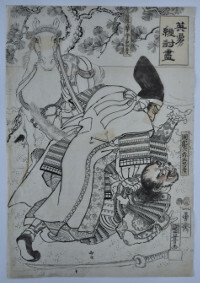 Signed Ichiyusai Kuniyoshi ga. Rare. A fine original sumi drawing (hanshita-e) for an unpublished print for the set Tokaido gojusan tsui, “Fifty-three Parallels for the Tokaido Road.” The set was published by various publishers in 1845-6 and was a collaboration with Kunisada and Hiroshige. Sumi on thin paper. This is a design for the lower half of the oban print, the top half having the title and a panel with the name of the post-station. Shows Yamato Takeru no Mikoto. A legendary prince, son of the Emperor Keiko. Shown here with his retainers. In extremely good condition. Provenance: Purchased from me in 21/11/1975. Rare. An original preliminary oban sumi drawing for an unpublished set. 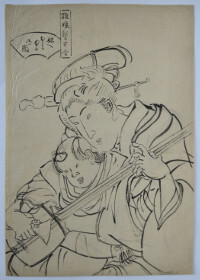 Shows a young woman teaching a child to play the shamisen and how to use the plectrum (bachi). With intended series title: Osana musume keiko awase, “Teaching the Arts to a Young Girl.” And sub-title: Imouto e oshieru no zu, “Picture of Teaching a Younger Sister.” A particularly interesting drawing as it shows the spontaneity of the initial concept. 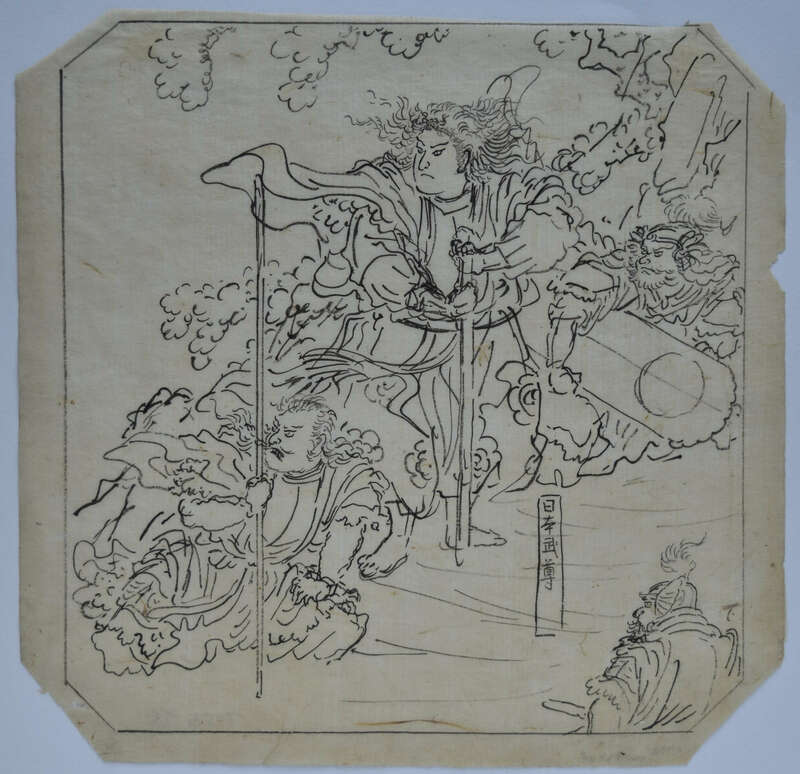 Kunisada may have made a further more detailed sketch but a final very detailed drawing was needed for the block-cutter to follow accurately and this would have been given to a pupil to undertake. For obvious reasons, these drawings did not survive. 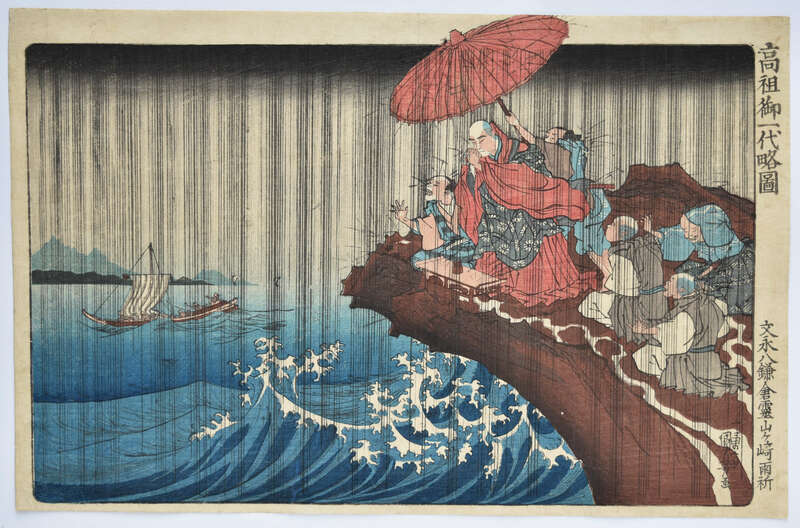 Nichiren praying for rain from the set Koso goichidai ryakuza, “Illustrated Abridged Biography of the Founder.” The set published by Iseya Rihei, c. 1835. The event is supposed to have taken place at the Reizan Promontory, Kamakura in 1271. Bunei hachi Kamakura Reizangasake uki. Nichiren was the founder of the Buddhist Nichiren sect of which Kuniyoshi was a follower. This is the very rare first edition without the break in the black border on the left near the small boat. Another first edition impression is in the Baur Collection, Geneva. See Matthi Forrer, 1994, G366. Most impressions show the break. For example: Kuniyoshi, Juzo Suzuki, 1992, no. 179. There are also variant later impressions with differences in the gradation of the sea and the promontory. Very fine impression. Fine colour. Imperceptible centre fold and trimming at top, otherwise very good condition. 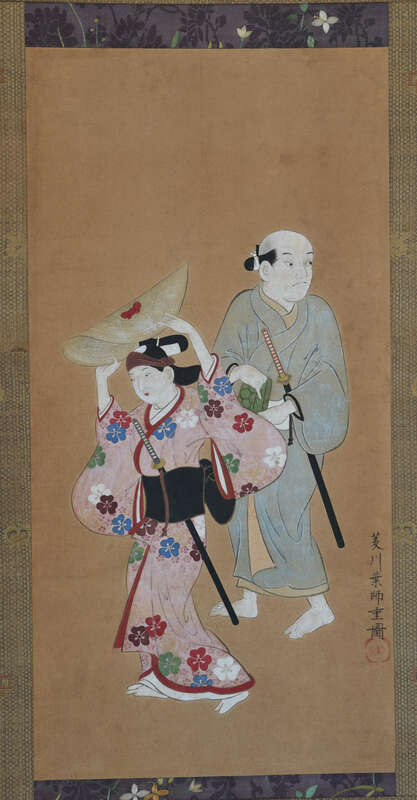 Signed Ichiyusai Kuniyoshi ga.
Nise Murasaki inaka Genji, “An Imposter Murasaki and a Rustic Genji.” A triptych based on an involved story written by Ryutei Tanehiko in 1829 and based on the classic 11th century Tale of Genji. Shows Prince Genji with his lover Tasogare at an old temple. A demon appears pretending to be Genji’s wife Futaba, but in reality is Tasogare’s mother, Shinonome. Genji, discovering her true identity, reveals that his affair with her daughter is only in order to regain the family sword. Tasogare and her mother commit suicide due to the great shame. Published by Akiyama Buemon in 1884. Fine impression, colour and condition. 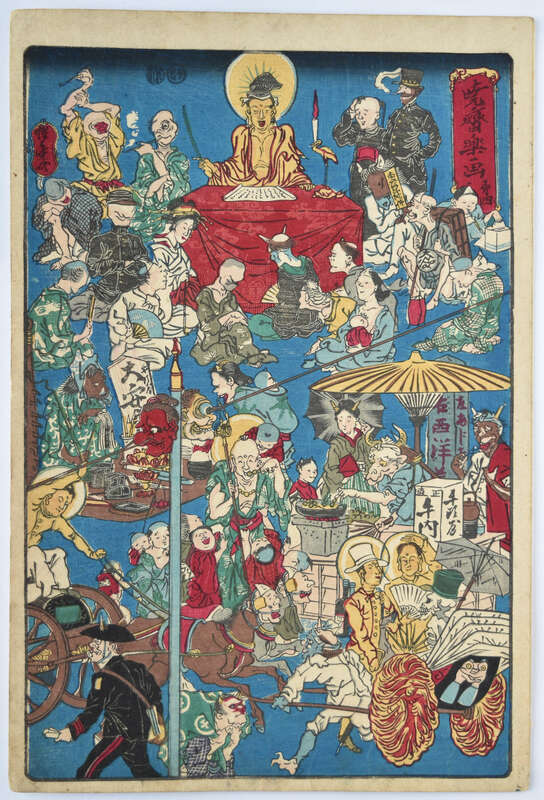 Signed Yoshitoshi sha.